Dense groves of Rhizopora occupy the core of the island's fringe, as well as the two flanking patches of reclaimed swampland. But the tip of the southern end of Pulau Semakau's western shore stands firm against the tide of natural succession. The woods within run wild with feral palms and a bedlam of ferns. Unchecked by sharp hooves and a mature canopy of cauliflower crowns, the dense undergrowth hides the contour of the earth and threatens to lead unwary feet into old ponds that once watered the ghosts of a coastal village. Screwpines, their snaking trunks overladen with multiple apexes, lie sprawled just beyond the beachfront. A raised corner above the coarse sand shelters an enclave of Polynesian arrowroots, which make their final stand against local extinction on this and nearby isles. 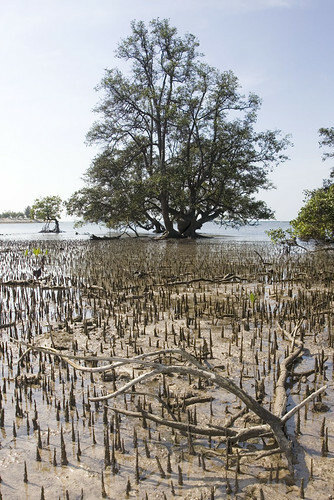 Moving southward, the overgrown land of former settlements gives way to mud lobster mounds and mangrove ferns. The terrain becomes impassable; thorny pandans guard the passages and a phalanx of twigs and fronds bar the way through a tunnel of soft mud. Undeterred by a flimsy armour of cotton, the resident swarm is aroused into a biting cloud that follows their prey onto the shore. Save the staccato calls of rufous-tailed tailorbirds who have made this abandoned corner their stronghold, the only audible waves are those that lap the tawny grains. There was no sign of the mixed flocks that would crash through the foliage, twittering apace and picking off startled bodies before winging it to fresh grounds. A large creek separates the old growth from the replanted plot. 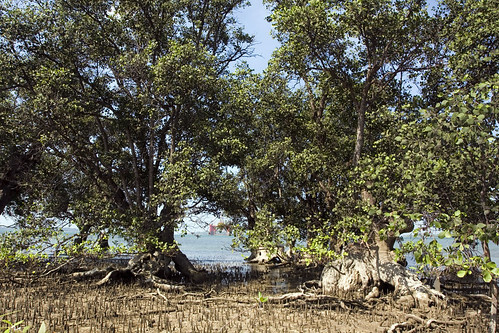 Its hydrological influence might play a subtle role in maintaining the dominance of white mangroves over the reds on this triangle of semi-soft sediment. Their breathing roots rise in a thick bed of thin spikes, trapping a layer of pale silt rather than the dark muck favoured by prop roots. The trees on the southern front are far older than many on the mainland. Scorning glorious heights, they celebrate their age with a lofty broadening of their bases, piling on xylemic mass with grotesque cavalierity to their trunks that protrude with the dignity of misshapen gnomes. Gobies scatter and skip in the pools amidst the pneumatophores to escape salt-bleached boots. The frantic thrusts of pygmy woodpeckers rattle over the slow blue swirl of the shallow sea. 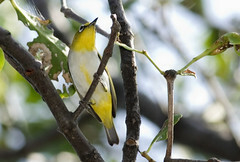 In a nearby tree, small shapes and high warbles betray the fowl play of a family of white-eyes, which feed here without fear of life in gilded cages. But even on this sliver of a promontory, there is no escape from hopes too fleeting to be captured and the trap of words that escape notice and leave no trace of what it means to be true to your thoughts and to you.